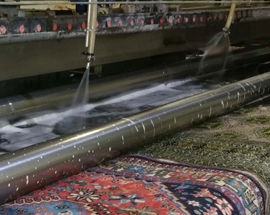 Our family-run enterprise has been handed down during 3 generations and is the leader in washing, restoration and selling of oriental carpets, with home delivery service in the whole country; great success, thanks to lots of customers who have appreciated us. Reliability, Experience and Dependability for over 40 years in Italy. 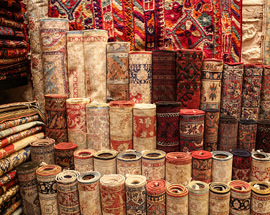 Extensive assortment of carpets, continually updated with constant searches and selections on the main world markets. Please contact us to rediscover this art: every carpet is guaranteed by a certificate of authenticity and origin. Our "Mobile Shops", which can transport over 170 carpets of various dimensions and origins, offer the client the opportunity to preview particular carpets, also after specific request, with no obligation to buy. You can therefore try the carpets at your home, with the possibility to verify their dimensions, colors and combination with your home furnishings. This service is available to individuals, offices, Embassies, Institutions, Hotels, Associations and Professional Firms. 40 years of experience. Warranty certificate. They can transport over 170 carpets of various dimensions and origins and offer the client the opportunity to preview particular carpets, also after specific request, with no obligation to buy. S.O.S. Emergency intervention in case of flooding, with immediate pick up. Washing of carpets, kilims by softening, anti-smell and moth-killing oriental method. Washing of fitted carpeting, curtains, window coverings and design textiles. 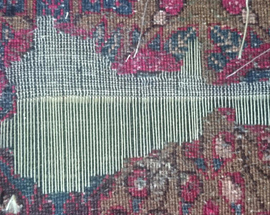 Restoration for all carpets, kilims, antique or modern tapestries. Washing of curtains, window coverings, tapestries of every kind, with dismantling and re-installation service; washing of fitted carpeting, curtains, window coverings and design textiles. Washing of duvets – quilts of every kind and woollen blankets (single/double beds), with vacuum-sealing.